Our dog behavior questionnaire site is now live! We’ve had an incredible response in the first week – thank you to everyone who has joined up. Do you have a dog? Join the project at www.darwinsdogs.org. There is no cost for participation – and we’ll let you know about anything we find out. We’re studying how the dog genome has changed as dogs evolved from wolves to beloved companions and work partners. If we can understand how genetic changes can lead to behavior differences — even for normal behaviors — we will have new insight into psychiatric and neurological diseases in dogs and people. Dr. Diane Genereux joins the Karlsson lab! Dr. Diane Genereux has joined the Karlsson Lab, doubling the postdoc ranks! Diane has an impressive research background in evolution, epigenetics, and mathematical modeling and is now delving into the complexity of bioinformatics. While not exploring the genetics of cholera susceptibility, she acts as lab photographer – and captured some great photos of the Darwin’s Dogs launch in Somerville, MA in September. Our new dog genetics project is launching on Sunday, September 13 at the Somerville Dog Festival. Do you own a dog? We need your help! You can visit our booth between 10 am and 3 pm on Sunday at Trum field in Somerville, Massachusetts. We’ll be enrolling dogs, and handing out frisbees and bandannas. The Somerville Dog Festival is a fun (and free!) event for dogs and people. This year (at 1 pm) they will try to break a World Record. If you can’t make it to Somerville, don’t worry! You can also join the Darwin’s Dogs pack online. There is no cost to you. We’ll ask you to tell us about your dog’s behavior and personality using short questionnaires on our website, and then send you an easy-to-use kit to collect a saliva sample from your dog. Using the saliva samples from many dogs, we will look for differences in DNA connected to particular personality traits or behaviors. We want to understand how dog DNA changed as dogs went from living in the wild to being part of our families. If we can understand how genetic changes can lead to behavior differences — even for normal behaviors — we hope to get new insight into psychiatric and neurological diseases in dogs and people. Dr. Jesse McClure joins the Karlsson Lab! 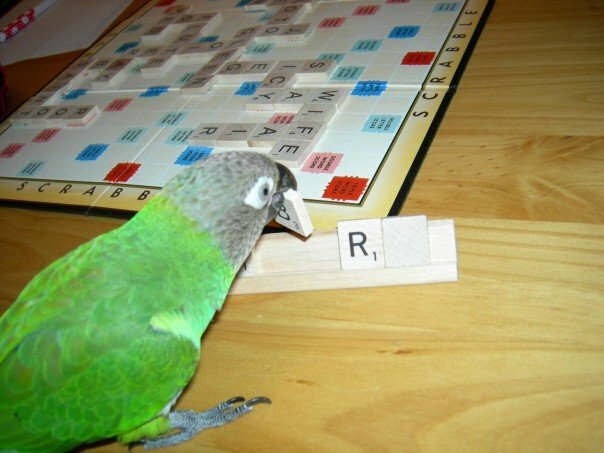 Jesse even taught his parrot Auggie to play Scrabble. Dr. Jesse McClure joined the Karlsson lab this summer as our first postdoc! Jesse will be working on a pet dog genetic mapping project we’ve dubbed “Darwin’s dogs”. 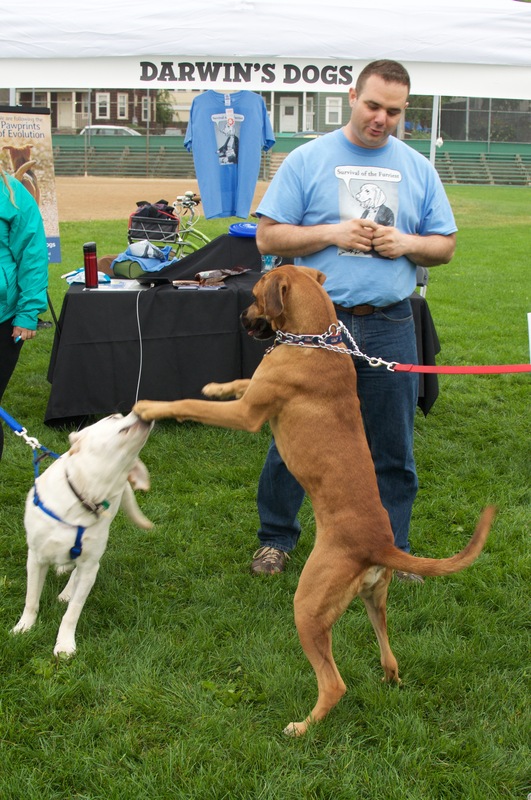 Jesse has an impressive background in animal behavior, starting as a military working dog trainer, and recently finished his doctorate in neuroscience and behavior at the University of Massachusetts Amherst. The Karlsson Lab in the Program Bioinformatics and Integrative Biology at the University of Massachusetts Medical School is looking for an exceptional postdoctoral candidate to lead our work developing innovative new computational methods for studying human evolution in collaboration with scientists at the Broad Institute. The Karlsson lab uses the distinctive patterns left by ancient evolutionary events to investigate how our immune system combats infectious diseases, and how we can improve treatments and vaccines for diseases, like cholera, that affect millions of people every year. Computational postdoctoral fellow who can conceive and develop algorithms and analysis approaches for integrating diverse types of data and identifying functionally important genes and regions. A highly competitive salary and excellent benefits package will be provided commensurate with experience. Devise new algorithms and approaches to analyze natural selection, association and other types of whole genome data. This position is an opportunity for experienced computer scientists to work at the cutting edge of medical genomics. The ideal candidate will have a strong quantitative research background and practical experience working with large, complex data sets, developing new analysis methods, and producing high quality published work. Experience in machine learning, signal processing and/or data mining is preferred. A background in human genetics and computational biology is helpful, but not required. The candidate will also have shown the ability to solve complex problems individually and as part of a team; have excellent oral and written English communication skill; and have experience developing software in one or more programming languages. Preference will be given to candidates with degrees in computer science, bioinformatics, statistical genetics or other applied quantitative fields. Our paper on two common cancers in golden retrievers is published in PLoS Genetics! Canine B-cell lymphoma and hemangiosarcoma are malignancies of the hematologic system that are clinically and histologically similar to human B-cell non-Hodgkin lymphoma and angiosarcoma. We were part of a large group of scientists, led by Noriko Tonomura and Kerstin Lindblad-Toh, that idenitifed genetic variants associated with a risk of developing these diseases in golden retrievers, and showed they appear to affect pathways involved in T-cell mediated immune response in the tumor. Thank you to all the golden retrievers (and their owners) who made this work possible! Congratulations to Crystal Harris and our collaborators at MGH and iccdr,b on the publication of their paper “Comparative Proteomic Analysis Reveals Activation of Mucosal Innate Immune Signaling Pathways during Cholera” in Infection and Immunity this week. Apply to join the Karlsson lab! Are you interesting in doing independent, exciting research? We are looking for a computational postdoc with a strong quantitative research background to devise creative new ways to analyze genomic data. To continue the proud tradition of the Sabeti lab, where Elinor did her postdoc, the first Karlsson lab holiday card is out! 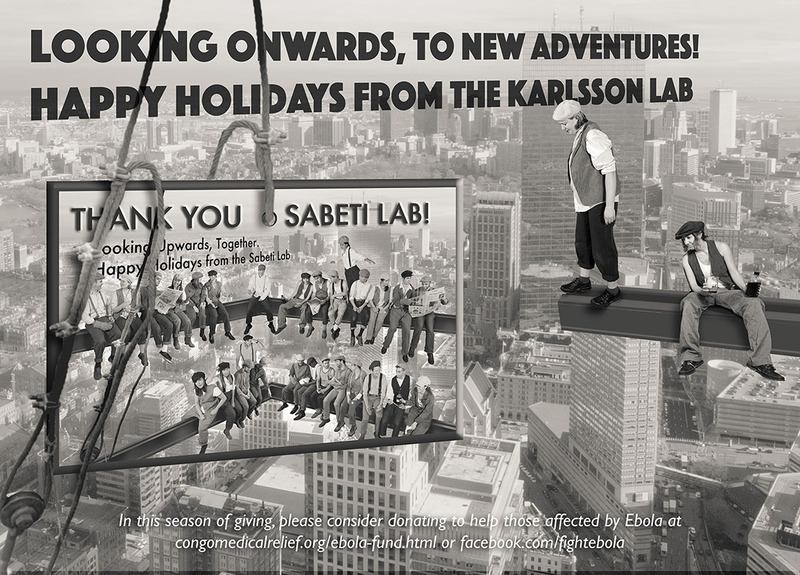 It is a play on the Sabeti lab’s homage to the famous Charles C. Ebbets “Lunch on a Skyscraper” photo.